This week leading up to May Day, Singapore will be seeing a flurry of events going on. Aside from the usual NTUC rally, there will also be the Inaugural Labour Day Protest: For a Better Singapore at Hong Lim Park, the Stand Up on May Day: Make Hong Lim Happy event (which coincidentally will also happen at Hong Lim) and last Saturday’s SDP Labour Day forum. Usually I would spend the weekend sleeping in and lepak-ing, but my naturally kay poh self was intrigued when a friend asked me to join him at the SDP Labour Day forum. These people’s frustrations seem to stem from their opinion that the union has not been doing anything to empower the workers. In fact, one of the speakers shared that in the 1960s, many trade union leaders were detained under the Internal Security Act for demanding better working conditions and higher pay. This jogged my memory back to an article that described NTUC as a toothless tiger – and I actually shuddered to think what would have happened if it was instead an aggressive one that rallied workers to go on strikes whenever their demands are not met! Will Singapore be the same today? Would our economy have achieved the same growth if investors avoided our country like a plague because Singapore uses strikes and violence as a means of social change? In a recent strike by the ground staff of Lufthansa due to a pay dispute, the German airline could only run 32 of its scheduled 1700 flights. That’s less than 5% of its operations! According to Reuters, passengers were quoted expressing their displeasure. This video really puts things into perspective of how damaging strikes can be, whether to the organisation or to others who rely on their goods and services. That’s a lot of inconvenience and unhappiness for everyone involved, don’t you think? 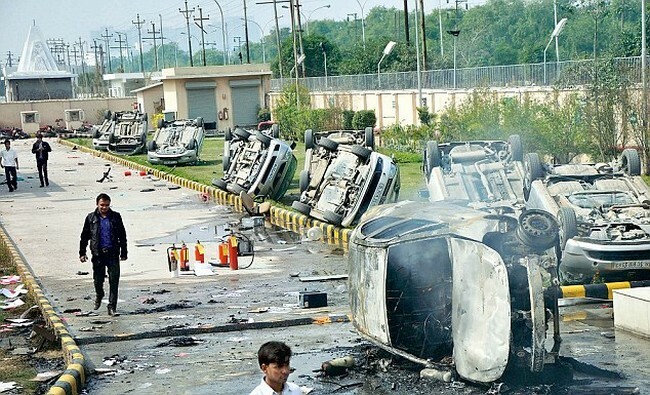 A series of violent protests in Noida, India, eventually resulted in more than 12 people getting injured, vehicles set on fire, and infrastructure getting damaged! Do we really want to see that happening in Singapore? At the end of the day, what employees want are channels for them to air their grievances and have the unions represent their interests. This is how the tripartite relationship works towards Singapore’s favour. Employees can go to the union with their issues, which will then be taken up to the management. If an agreement can’t be reached, the issue is then escalated to the Ministry of Manpower, and then to the arbitration court for a hearing if there is still no resolution. What happens in this case is that all parties strive for a win-win situation, and everyone walks away from the agreement with no hard feelings. I don’t think this would be the case if strikes were used frequently to make sure demands are met! Mr Thomas, a former general secretary of the Singapore Shell Employees Union, shared that while NTUC’s social services and facilities are more visible to the general public, its work in resolving workers’ well-being is mostly done behind the scenes. There isn’t an absolute right or wrong perspective in looking at this, but one thing I am sure of, Singapore will definitely be a happier place if we focus on being more positive!